O God, who through the Bishop Saint Cyril of Jerusalem led your Church in a wonderful way to a deeper sense of the mysteries of salvation, grant us, through his intercession, that we may so acknowledge your Son as to have life ever more abundantly. Through our Lord Jesus Christ, your Son, who lives and reigns with you in the unity of the Holy Spirit, one God, for ever and ever. 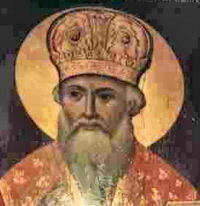 Cyril, bishop of Jerusalem, was banished from his see on three occasions. With St. Athanasius and others, he belongs to the great champions of faith in the fight against Arianism. Famous as a teacher and preacher, he has left a series of catechetical instructions that constitute a priceless heirloom from Christian antiquity. Of the twenty-four extant discourses, nineteen were directed to catechumens during Lent as a preparation for baptism, while five so-called mystagogical instructions were given during Easter time to make the mysteries of Christianity better known to those already baptized. Historically today is the feast of Our Lady of Mercy. Cyril of Jerusalem was given to the study of the Holy Scriptures from childhood, and made such progress that he became an eminent champion of the orthodox faith. He embraced the monastic institute and bound himself to perpetual chastity and austerity of life. He was ordained priest by St. Maximus, Patriarch of Jerusalem, and undertook the work of preaching to the faithful and instructing the catechumens, in which he won the praise of all. He was the author of those truly wonderful Catechetical Instructions, which embrace clearly and fully all the teaching of the Church, and contain an excellent defense of each of the dogmas of religion against the enemies of the faith. His treatment of these subjects is so distinct and clear that he refuted not only the heresies of his own time, but also, by a kind of foreknowledge, as it were, those which were to arise later. Thus he maintains the Real Presence of the Body and Blood of Christ in the adorable sacrament of the Altar. On the death of Patriarch St. Maximus, the bishops of the province chose Cyril in his place. As Bishop he endured, like blessed Athanasius, his contemporary, many wrongs and sufferings for the sake of the faith at the hands of the Arians. They could not bear his strenuous opposition to their heresy, and thus assailed him with calumnies, deposed him in a pseudo-council and drove him from his see. To escape their rage, he fled to Tarsus in Cilicia and, as long as Constantius lived, he bore the hardships of exile. On the death of Constantius and the accession of Julian the Apostate, Cyril was able to return to Jerusalem, where he set himself with burning zeal to deliver his flock from false doctrine and from sin. He was driven into exile a second time, under the Emperor Valens, but when peace was restored to the Church by Theodosius the Great, and the cruelty and insolence of the Arians were restrained, he was received with honor by the Emperor as a valiant soldier of Christ and restored to his see. With what earnestness and holiness he fulfilled the duties of his exalted office was proved by the flourishing state of the Church at Jerusalem, as described by St. Basil, who spent some time there on a pilgrimage to the holy places. Tradition states that God rendered the holiness of this venerable Patriarch illustrious by signs from heaven, among which is numbered the apparition of a cross, brighter than the sun, which was seen at the beginning of his Patriarchate. Not only Cyril himself, but pagans and Christians alike were witnesses of this marvel, which Cyril, after having given thanks to God in church, announced by letter to Constantius. A thing no less wonderful came to pass when the Jews were commanded by the impious Emperor Julian to restore the Temple which had been destroyed by Titus. An earthquake arose and great balls of fire broke out of the earth and consumed the work, so that Julian and the Jews were struck with terror and gave up their plan. This had been clearly foretold by Cyril. A little while before his death, he was present at the Ecumenical Council at Constantinople, where the heresies of Macedonius and Arius were condemned. After his return to Jerusalem, he died a holy death at sixty-nine years of age in the thirty-fifth year of his bishopric. Pope Leo XIII ordered that his office and mass should be said throughout the Universal Church. Read part of St. Cyril's Catechetical Lectures On the Passion of Our Lord Jesus Christ, which is very fitting meditation material for Lent. With these friars came their celestial patroness, the Virgin of Mercy, a Marian title of the thirteenth century. Tradition has it that around 1218, St. Peter Nolasco and James I, King of Aragon and Catalonia, experienced separately a vision of the Most Holy Virgin who asked them to found a religious order dedicated to rescuing the many Christian captives held by the Moslems. This Order of Our Lady of Mercy, approved as a military order in 1235 by Pope Gregory IX, was able to liberate thousands of Christian prisoners, and later became dedicated to teaching and social work. The Mercederian friars' habit imitates the garments worn by the Virgin when she appeared to the founder of the order. [Our Lady of Our Lady of Mercy] The image of the Virgin of Mercy is dressed all in white: over her long tunic she wears a scapular with the shield of the order imprinted breast high. A cloak covers her shoulders and her long hair is veiled by a fine lace mantilla. 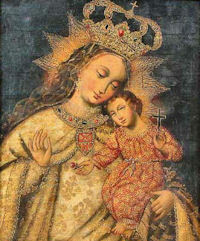 Some images have her standing, with the child in her arms, and others with her arms extended showing a royal scepter in her right hand and in the left some open chains, a symbol of liberation. Such is the appearance of the beautiful image venerated in the Basilica of Mercy in the capital of Peru. It was enthroned at the beginning of the XVII century and has been considered the patroness of the capital. In 1730 she was proclaimed "Patroness of the Peruvian Lands" and in 1823 "Patroness of the Armies of the Republic." On the first centennial of the nation's independence, the image was solemnly crowned and received the title of "Grand Marshall of Peru," on September 24, 1921, Feast of Our Lady of Mercy, since then declared a national holiday, when every year the army renders homage to her high military rank. The oldest level of St. Clement's is thought to be the titulus Clementis, one of the first parish churches in Rome, and probably belonged to the family of Titus Flavius Clemens, consul and martyr and a contemporary of Pope St. Clement. Set right next to a pagan temple, a Mithraeum or Temple of Mithras, it was one of the first churches in Rome.